An important part of leather maintenance is applying leather conditioner to make it long lasting, softer, durable and flexible. Only cleaning it without applying conditioner will not give it much shine and protection. Just like hair conditioner, leather conditioners work in same manner. It is as same as oil that provides a protective on the leather and gives it a shiny fresh look. The oils will sooner or later wear down and after every few months you need to apply the conditioner to your leather. So it is a routine process and without it your leather will dry out soon, just like our hair will when left unconditioned. If possible, use a standalone conditioner because combination or 2 in 1 product are not as effective. Leather Honey is best when used with leather cleaner. It is a well known brand in the industry. It is non-toxic, extremely gentle for leather, and gives it’s a healthiest and fresh shiny look. After Leather Honey Cleaner, Leather Honey Conditioner is simply another great product. If you use Leather Honey Cleaner, then using Leather Honey Conditioner is simply the next logical step for leather care. 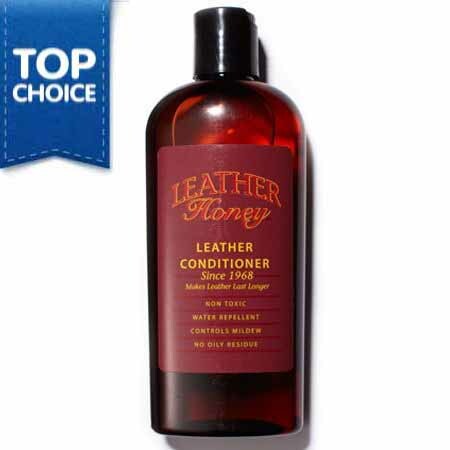 When Leather Honey Conditioner tested and compared with other competitors, we found that it really is a superior conditioner that lasts for long. It makes your leather look shiner and feels smoother for few months more than any other conditioners out there. We talked with some leather care experts and the Leather Honey Conditioner was found to be the most preferred brand for the purpose of maintaining car interior and furniture. The only pitfall with this product is that it is slightly expensive than other brands; However we consider it is a little price to pay for the best leather conditioner that gives such a superior performance. Fiebing’s Golden is best for unfinished leather like shoes, belts, jackets, and other apparel. Using Fiebing’s Saddle Soap before applying Fiebing’s Mink is strongly recommended because you usually apply conditioner on the clean leather. Fiebing’s Mink refills the lost oils in the leather and give it a new shiny look as well as add a protective layer to avoid dirt, stains, and germs as well. 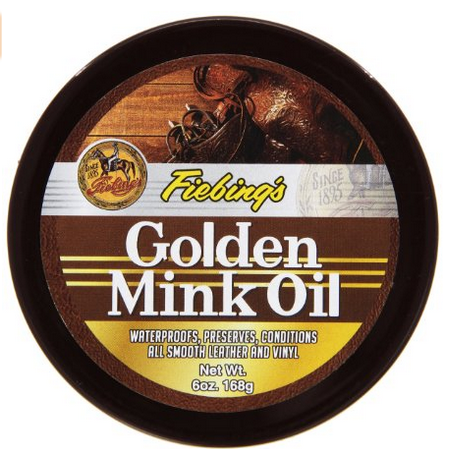 Fiebing’s Mink oil as its name implies, comes from the oils that are produced by mink’s skins. As unfinished leather soaks too much of oils, you need to ensure your leather accessories get the best types of oils. Not every oil work well for unfinished leather. For instance some oils such as olive oil, really break down the leather. Mink oil is completely compatible with unfinished type of leather and therefore preserves it in a better way. Mink oil gives the same qualities of organic raw leather. Mink oil can slightly darken the leather therefore we suggest applying it on dark leather. You might be using leather conditioner more often so only use the best Leather conditioner like Fiebing’s Mink Oil for your unfinished leather. Fiebing Mink makes your feel smooth, look shiny and gives it a protective layer to make it water resistant, and protect it from dirt, debris, dust, mildew, bacteria, and other possible germs. 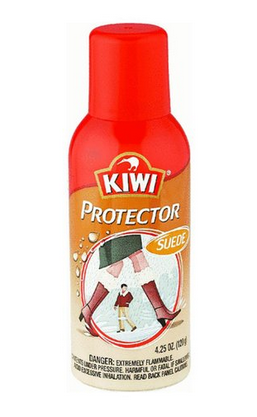 For suede or nubuck, look for best leather conditioner like Kiwi Suede Protector. Nubuck or Suede are most difficult type of leather when it comes to cleaning and conditioning and need special care and attention. As nubuck and suede are types of leathers that are closest to its natural form, that have numerous pores in them and welcome too much dirt and debris that gets deep into the leather easily become a challenge for cleaning or conditioning it. It contains a special blend of polymer that provides a transparent layer of coating on over the leather to make it dirt, debris or water resistant. Applying it is also very easy; just spray it on your leather accessories, leave it to dry and re-apply if needed. As it is quite hard to clean suede and nubuck, it is even much more difficult to such conditioner that really works on nubuck or suede. 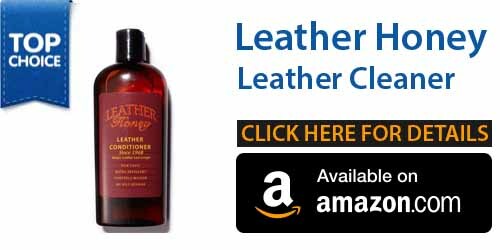 We tested out many and spent many dollars to find a perfect leather conditioner. Kiwi Suede Cleaner was found to be on the top. 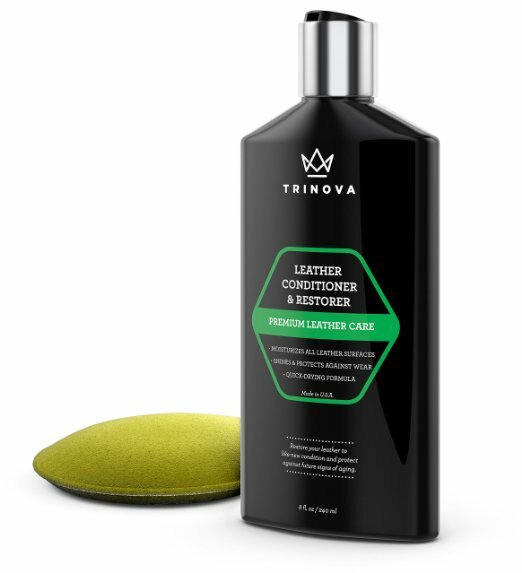 If you are looking for the best leather conditioner and restorer with water repellant formula for cleaning and maintaining your leather items, then you should definitely take a look at Trinova leather conditioner and restorer with water repellant formula. There are many advantages of using this leather conditioner and restorer. This leather conditioner and restorer will bring back the old life to your leather or vinyl surfaces and will provide durable and safe protection of the surfaces. It will also brighten up the overall look by adding a bright supple and shine to the leather. You can also prevent the premature cracking and also drying of the leather surface by using this leather conditioner and restorer each month. After application of this conditioner to your leather product, you will find a very rich leather fragrance. This conditioner is non toxic and it also is rain, water and snow repellant which will protect your leather surface effective from these conditions. You can use the Trinova conditioner for any leather surface and it will effectively condition, restore and protect the leather surfaces where you will use it. But this conditioner shouldn’t be used for suede but can be used for exotic leather as well. Are you someone who is looking for the perfect leather conditioner for your leather items? Then you should definitely consider Bick more Bick 4 leather conditioner 8 ounces for your valuable leather items. The Bick more Bick 4 leather conditioner effectively conditions, polishes, cleans and acts as a stain repellant; so that you can be assured that your valuable leather item will not be damaged from any type of stains. The Bick more Bick 4 leather conditioner 8 ounces are made in USA. Also this leather conditioner is very effective on all types of smooth and finished leathers such as exotic leathers. It is also safe to use this leather conditioner on your leather made boots, footwear such as sandals or shoes, furniture, bags and also on clothing items such as leather jackets. This product has its good share of advantages as this product will ensure that your leather items are kept soft and supple and this leather conditioner is wax free. There is no need to use any type of other additional protectors or cleaner if you are going to use the Bick more Bick 4 leather conditioner. What should you check when purchasing the Leather Conditioner? Make sure that the leather conditioner that you are purchasing is for conditioning the right type of leather item. For example: there are some specific leather cleaners, that is only for furniture, while some are for conditioning other types of leather items such as jackets or bags. If you use the wrong leather conditioner for your leather item, the result will not be effective. You should test a small area of the leather surface that you are intending to condition with the leather conditioner and check for the visible results. If it doesn’t cause any reaction, then it is safe to use on the leather surface.